The Monsanto Protection Act? A Debate on Controversial New Measure Over Genetically Modified Crops | Democracy Now! director of the Biotechnology Project at the Center for Science in the Public Interest, a nonprofit consumer advocacy organization that addresses food and nutrition issues. executive director of Food & Water Watch. She recently wrote a book called Foodopoly: The Battle Over the Future of Food and Farming in America. On Wednesday, the organization is releasing a major new report called “Monsanto: A Corporate Profile.” Hauter’s family runs an organic farm that provides produce to hundreds of families as part of the growing nationwide community-supported agriculture movement. Read Report: "Monsanto: A Corporate Profile." AARON MATÉ: President Obama outraged food activists last week when he signed into law a spending bill with a controversial rider attached. Critics have dubbed the rider the “Monsanto Protection Act.” That’s because it effectively says the government must allow the planting of genetically modified crops even if courts rule they pose health risks. The provision calls on the U.S. Department of Agriculture, the USDA, to, quote, “grant temporary permit(s) or temporary deregulation,” unquote, to the crop growers until an environmental review is completed. In other words, plant the GE crop first and assess the impact later. AMY GOODMAN: One of the biggest supporters of the provision was Republican Senator Roy Blunt of Missouri, Monsanto’s home state. Blunt reportedly crafted the bill’s language with Monsato’s help. On the other side was the lone member of the Senate who’s also an active farmer, Democrat Jon Tester of Montana. Senator Tester tried to remove the rider when the budget bill made its way through Congress last month. Speaking on the Senate floor, Tester said the provision would undermine judicial oversight and hurt family farmers. SEN. JON TESTER: The United States Congress is telling the Agricultural Department that even if a court tells you that you’ve failed to follow the right process and tells you to start over, you must disregard the court’s ruling and allow the crop to be planted anyway. Not only does this ignore the constitutional idea of separation of powers, but it also lets genetically modified crops take hold across this country, even when a judge finds it violates the law—once again, agribusiness multinational corporations putting farmers as serfs. It’s a dangerous precedent. Mr. President, it will paralyze the USDA, putting the department in the middle of a battle between Congress and the courts. And the ultimate loser will be our family farmers going about their business and feeding America in the right way. AARON MATÉ: Well, Senator Tester’s effort failed, and the rider was included in last month’s legislation that avoided a government shutdown. Now that President Obama has signed the spending bill into law, some uncertainty remains over whether it introduces a new policy or whether it codifies existing government practice. But regardless, it’s galvanized the food justice movement here in the U.S., renewing calls for greater oversight of genetically modified foods and of corporate control of the food chain. And although they may have lost the first round, food activists are gearing up for another fight later this year: Because it was passed as a rider and not as its own legislation, the provision will expire in six months, when it will surely come up again. AMY GOODMAN: Well, to discuss the so-called “Monsanto Protection Act” and the issue of genetically modified foods, we’re joined now by two guests. Gregory Jaffe is director of the Biotechnology Project at the Center for Science in the Public Interest, a nonprofit consumer advocacy organization that addresses food and nutrition issues. He has expressed cautious support for genetically engineered foods. We’re also joined by Wenonah Hauter, the executive director of Food & Water Watch. On Wednesday, her group is releasing a major new report called “Monsanto: A Corporate Profile.” Hauter’s family runs an organic farm that supplies produce to hundreds of families as part of the growing nationwide community-supported agriculture, or CSA, movement. And she’s author of the book Foodopoly: The Battle Over the Future of Food and Farming in America. We invited Monsanto also to join this, but they declined to come on the program. Why don’t we start with Wenonah Hauter? Can you describe what this rider is and how you believe it got into the spending bill that was passed? WENONAH HAUTER: Well, this rider is unprecedented and really outrageous interference with our courts and the separation of powers. Now, the biotech industry has been working to get a rider like this into federal legislation since early last spring, when they attempted to attach it to the farm bill, which actually never passed. Now, what happened is, in all of the pressure to pass a spending bill that would allow government agencies to continue operating, the rider was attached, and it went through Senator Barbara Mikulski’s Appropriations Committee. And she left this rider in the bill, and we hold her responsible. Now, part of the problem with these large spending bills that have to pass very quickly is there’s a lot of room for this kind of mischief. And these spending bills are a response to the dysfunction in Congress when we can’t have a normal budgeting process. And what this rider actually does is it prevents the courts from stepping in under our most important environmental law, the National Environmental Policy Act, which gives citizens the right to sue: If they believe that the government is about to make a very large and important decision that will have many impacts, they can sue for judicial review. And this rider will prevent that in the case of genetically engineered crops being planted after a court says that there hasn’t been a proper environmental assessment. We’re very concerned about this, because there are a number of crops in the pipeline, like 2,4-D corn, which could actually be impacted by this rider. Now, because this is a budget bill and the budget bill will run out at the end of this fiscal year, which is September 31st, this bill or this rider will no longer be in effect. However, we should be concerned. Because of the dysfunction in Congress, it’s possible that the spending bill that was just passed could just be reauthorized for the coming months until a new budget could be debated and passed. So, activists are organizing around the country to put pressure on elected officials to make sure that this doesn’t happen. AARON MATÉ: And, Greg Jaffe, you’re with the Center for Science in the Public Interest. Your response to this bill? And does it represent something new here? GREGORY JAFFE: So, I mean, let me first say that I don’t support this rider in the bill, but I also—I’m surprised. I’m not sure—I don’t see why it was necessary by the people who thought it needed to be put into law, nor do I think that it changes the current powers or legal authority that the USDA already had or the relationship of the courts and the executive branch. AMY GOODMAN: Talk about why you feel that this bill, Gregory Jaffe, or the rider on the bill doesn’t change things. GREGORY JAFFE: OK, so, you have to go back a few years. And the way that USDA regulates genetically engineered crops is they regulate them under the Plant Protection Act, and they ensure that these plants don’t have any plant pest characteristics or harm agricultural interests. And so they regulate them, and at some point they decide to deregulate them, to decide that they don’t have any of these risks associated with them, and they can be planted freely by farmers. That is a major federal action, and at the same time they need to comply with the National Environmental Policy Act, as Wenonah mentioned, and that requires them doing an assessment of the potential environmental impacts of their—of their action. And that’s required by all federal agencies when they do any major action that might impact the environment. Several of these decisions by USDA have been challenged in court. The genetically engineered alfalfa was challenged in court. The genetic-engineered sugar beets was challenged in court. And in both of those cases, the court said that while USDA didn’t violate the Plant Protection Act, didn’t make a wrong decision regarding whether the genetically engineered crop was a plant pest, they didn’t follow the right procedures, and they didn’t do the proper assessment under the National Environmental Policy Act. And so, the courts, to a large extent, slapped the hand of the—the wrist of the USDA and said, “You have to go back and do that, and until you do that, your decision on the merits on whether the genetically engineered crops harm agriculture needs to be vacated.” And so they went back, and they did that. Now, in the case of the sugar beets, while they were doing that environmental assessment, they issued temporary permits, which they are allowed to do, or temporary deregulation, under the current Plant Protection Act. So they figured out a way to allow farmers to grow that crop in—with conditions imposed, so that they wouldn’t impact the environment in any way, so that there wouldn’t be any potential environmental impact while they carried out the National Environmental [Policy] Act’s environmental assessment. So, I think that’s what this provision says. It says that if a court vacates or turns back a decision by the secretary about a genetically engineered crop, that the secretary can go ahead and issue a temporary permit or partially deregulate that crop, with conditions—the language specifically talks about with conditions—that ensure that there’s no environmental impact, while they go ahead and comply with the court’s order. AMY GOODMAN: —what is the problem here, then, if there has been no change? WENONAH HAUTER: Well, there—one of the changes is that it has delayed these crops getting into the food system. But I don’t think we want to get caught up in the technical details of how these crops are laxly approved. What we have here is Monsanto flexing its political muscle, because it’s not only trying to pass riders like the current one on judicial review, it’s been trying to get riders on these big spending bills or the farm bill that would actually prohibit any review and would be a rubber stamp of these crops. I think we have to look at the enormous amount of power, political power, that Monsanto has, that it can actually get this kind of precedent-changing rider that could have effects in other areas, because we don’t like to see this kind of precedent that really prohibits judicial review. And I think we have to look at how much money that the biotech industry has spent on lobbying. I mean, over the last 10 years, the biotech industry has spent $272 million on lobbying and campaign contributions. They have a hundred lobby shops in Washington. They’ve hired 13 former members of Congress. They’ve hired 300 former staffers for the White House and for Congress. And Monsanto alone has spent $63 million over the last 12 years on lobbying and campaign contributions. This is about political muscle and forcing their will on the American people. And if we don’t put a stop to it here, we’re going to see many, many more serious violations. AMY GOODMAN: We’re going to go to break and come back to this discussion. We’re talking to Wenonah Hauter, who is author of Foodopoly: The Battle Over the Future of Food and Farming in America, and Greg Jaffe, who is with the Center for Science in the Public Interest. We’re talking about Monsanto, which is the world’s largest producer of genetically modified seeds. We invited them on; they declined to come on. We’ll be back in a minute. AMY GOODMAN: Our guests today are Greg Jaffe—he’s with the Center for Science in the Public Interest—and Wenonah Hauter of Food & Water Watch. Her book is called Foodopoly: The Battle Over the Future of Food and Farming in America. But I want to go to the core of really what you’re both concerned about, and that is the issue of genetically engineered foods. Greg Jaffe, you’re not as concerned as Wenonah Hauter. Talk about what genetically engineered foods are and what your thoughts are on them. GREGORY JAFFE: So, farmers have been growing genetically engineered crops for about 15 years now in the United States. And those varieties of corn and soybeans and cotton and canola were engineered in the laboratory by scientists, where they add a gene from a different organism that imparts a specific trait, a beneficial trait, into that crop, and then that crop is grown, and then food is made from that crop. So we have some crops that have a built-in pesticide, for example, so that we don’t need to spray a chemical pesticide over the top of those crops. And so, if that’s a genetically engineered corn, that corn might end up in our food in terms of high-fructose corn syrup or cornstarch or corn flakes, and something along those lines. The evidence to date on the current crops that are grown in the United States is that those are safe to eat. I think there is a strong international consensus about that. And so, you know, at CSPI, we’re comfortable in telling people that if you’re going to be eating food made from those crops that are currently out there, there is not a food safety risk associated with those crops. That’s different than the regulatory system, and I think maybe that’s at the core of some of this. And I think that the—whether we’re talking about the USDA, the Department of Agriculture or the Food and Drug Administration or the Environmental Protection Agency, clearly the U.S. regulatory system and oversight of these crops has not been ideal. And so, at the center, we’ve been working for a number of years to try to improve that regulatory system, to give the agencies the authority to make sure, before these crops get out there, that they are safe to eat and they are safe for the environment. So while we can say they’re safe, current ones, for the future ones, we would like the agencies to take a little closer look at them. AARON MATÉ: Well, let’s get a response from Wenonah Hauter. Your thoughts on this issue, the argument here being that the science so far shows that it’s safe, but regulation needs to improve? WENONAH HAUTER: Well, first of all, I would disagree that there’s any international agreement that genetically engineered crops are safe. And, in fact, they’re banned in some countries. And there’s a lot of concern in places like Europe, where we have the precautionary principle, about genetically engineered foods. And there actually is a body of research that shows that genetically engineered soy and corn have health effects. These studies are feeding studies on animals, which is how this research is generally done. They show liver and kidney impairment—there are a number of studies showing this. 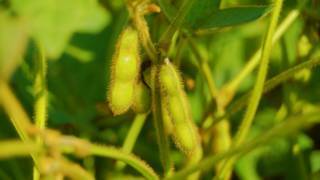 Rat pups whose mothers ate genetically engineered soy had high mortality rates. And the genetically engineered hormone that’s used to—it’s actually injected into cows so that they produce more milk. Italian research has found that those transgenes actually survive—they survive pasteurization, and they end up in the milk. So, part of the problem is also that there isn’t enough research. We have a very lax regulatory system. The technology licensing agreements that Monsanto and other companies have for the biotech products that they develop mean that researchers can’t legally get a hold of these seeds or grow the crops to actually do testing. And there’s also not money for the kind of long-term health impact studies that there should be when you’re doing such a major change in our food system. So I think there are a lot of reasons to be concerned. And we’re also talking about the immense control over seeds that, well, one company—I mean, we basically have three companies that dominate seeds in the world. So, if you’re saying that there’s no problem with genetically engineered seeds, you’re very narrowly looking at what the impacts could be on the developing world, even farmers here, where Monsanto regularly investigates 500 farmers, approximately, every year and sues them if they don’t adhere to their contract. Monsanto is very aggressive with farmers. And it’s very clear that this is simply a way to control seeds and profit from them, and from their co-branded chemicals, their herbicides like Roundup Ready, that are applied along with the genetically engineered crops that are sowed in the fields. AMY GOODMAN: Your response, Greg Jaffe? AMY GOODMAN: And do you feel it’s been adequately studied and that the corporate influence over the science hasn’t prevented that or contaminated the results? GREGORY JAFFE: I think that, you know, the Food and Drug Administration, the European Food Safety Agency, the WHO—the World Health Organization—the Royal Academy of Sciences, the National Academy of Sciences, a lot of these international scientific bodies have taken a look, as independent scientists, at not just the information that Monsanto or the biotech developer has provided, but all of the research out there. And I think that—in fact, I think the European Food Safety Agency spent millions of dollars giving independent researchers to do risk assessment work around these genetically engineered crops. And to date, the consensus has been—again, for the current crops that are out there—that those crops are safe to eat and that they have some environmental benefits and that any environmental risks that they have can be mitigated—keeping in mind, obviously, that the agriculture has a huge environmental footprint. AMY GOODMAN: Do you feel the science is as established as Greg Jaffe is saying, Wenonah Hauter? WENONAH HAUTER: No, I don’t think that the science is as established. And I think you have to look at the enormous power that these companies have on our regulatory agencies here and increasingly in Europe. We at Food & Water Watch have a Brussels office, and one of our main jobs there is trying to document the footprint that our U.S. biotech industry is having in Europe, trying to influence their Food Safety Agency and the different governments that—some of which have bans on genetically engineered food. I think that this is a political issue. This is not about the safety of these crops, because there really has never been long-term research on what the impact is, both on the diet and on the environment. And I’m concerned when I see that the immense amount of money that Monsanto and other companies are spending on trying to greenwash themselves, when they are able to persuade well-meaning advocates that they’ve done a good job. I mean, I think we have to look at Monsanto. They have spent, just over a two-year period, $279 million on advertising, talking about how they want to feed the world and that they’re really doing this for the benefit of humankind, not to make money. But when you look at what they’re actually doing, they are making an enormous profit on seeds. Seeds are becoming increasingly expensive. And there are a lot of broader issues besides the few health impact and environment studies that have been done. I mean, we have to look at this in the broadest context of what it means to give one, two, three companies this much control over how seeds are sold and produced and food is produced. AARON MATÉ: Let’s talk about the movement to label products containing the ingredients made by these companies. While on the campaign trail in 2007, presidential candidate Barack Obama promised to label GMO foods, if elected. SEN. BARACK OBAMA: Here’s what I’ll do as president. I’ll immediately implement country-of-origin labeling, because Americans should know where their food comes from. We’ll let folks know whether their food has been genetically modified, because Americans should know what they’re buying. AARON MATÉ: That’s President Obama speaking in 2007, before he was elected president. Greg Jaffe, do you support the labeling of GMO foods? GREGORY JAFFE: We support the fact that consumers should have the right to know and should be able to get information about their foods, whether their foods are genetically engineered, whether their foods came from plants that were irradiated or were produced through chemical mutagenesis. So, we do think consumers who want to know about how their foods were produced and where they came from should have a right to do that. GREGORY JAFFE: That comes into this calculus. AMY GOODMAN: Let’s get Wenonah Hauter’s response to this issue of food labeling. Wenonah? WENONAH HAUTER: Well, consumers want, and should have the right, to know if their food is genetically engineered. And while many of the crops that have been genetically engineered do go into processed food, today we’re seeing the foods that end up on your plate being either already genetically engineered or in the pipeline for approval. I’m talking about the GE sweet corn that was approved last year. There has been a multi-year battle over GE salmon. And while we hope the FDA does not approve it, and there has been a huge outpouring of support for not approving it, we’re concerned that if they move ahead, it will not be labeled. WENONAH HAUTER: —in the near future. AMY GOODMAN: I know Greg Jaffe has to leave, and I want him to weigh in on genetically engineered salmon. Greg? GREGORY JAFFE: So, first, I might make a statement that I think, you know, the most important thing, if there’s any question about whether a food is an allergen or potential allergen because it was genetically engineered, our view is that that should not be allowed on the market. We shouldn’t use labeling as a surrogate for safety. We shouldn’t allow a food that is an allergen, that has a new allergen, onto the food supply and label it and let people choose. If there’s any food safety risk in that food, it shouldn’t be allowed, which is why we at CSPI advocate for a mandatory premarket approval process of these genetically engineered crops and analysis beforehand, because if there’s any question of safety, they shouldn’t go on the market. We don’t believe we should allow them on the market but, because they’re an allergen, label them and let people choose. So, I just wanted to clarify that. The genetically engineered salmon, I think that—I think there’s been a lot of misunderstanding out there about this genetically engineered salmon that’s in front of FDA for approval. In my mind, it’s really just a proof of concept application. The company has requested that this salmon be grown in one facility in Panama for inland tanks, and it’s only going to produce a small amount of this salmon. Less than 1 percent of the salmon that we would import would be this genetically engineered salmon. So, although I’m still waiting to see whether FDA does approve that and whether it’s safe to eat and safe for the environment, assuming that they do that, I think that it’s going to be a long time before we might see this as a dominant part of the salmon market. AMY GOODMAN: We’re going to break, and then we’re going to continue with Wenonah Hauter on her new book, Foodopoly. Greg Jaffe, I want to thank you so much for being with us, director of the Biotechnology Project at the Center for Science in the Public Interest, and also Wenonah Hauter with Food & Water Watch. We’ll come back with Wenonah in a minute. GREGORY JAFFE: Thank you very much.